Making a final grade and compacting fill are the next steps after you've prepared the ground and set up your concrete forms. Run a string line across the patio set-up. The string line should run from the top of the form on one side of the patio to the top of the form on the other side (the width/length of your patio). The ground should be 4 inches below the string line. If it's not, add more fill in the areas that are greater than 4 inches deep, and remove ground or fill in areas that are less than 4 inches below the string line. Move the string line over all of the patio to make sure the grade level is correct. This is also called "tamping". If you added fill, as determined when making the final grade (above), it's critical to compact it. 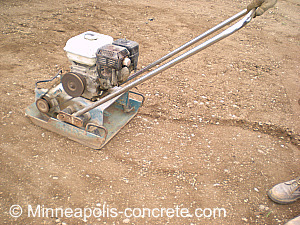 A compactor can be as simple as a hand tamper obtained from a hardware store or renting a plate compactor at a rental shop. If you choose to do it by hand, it will take longer. Simply pound the ground with the hand tamper where you placed the fill, until the ground is compact and hard. Another easy method to compact the fill is to run water from a garden hose over the filled sections until they get compact and hard. If you choose this method, wait until the ground is dry to pour the concrete. This may take a few days. If you choose to rent a compactor, first level off the fill with a concrete rake, a garden rake, or a shovel - anything that will spread the fill around. Then, run the compactor over the ground. If you have more than 12 inches to fill, put in about 6 inches of fill, run the compactor over it and then add another 6 inches and compact again. 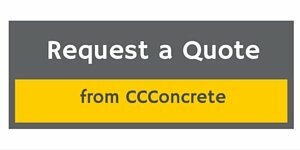 The next step in the process of pouring your own concrete patio is to add concrete reinforcement to make sure the concrete holds up well.